When considering paint for the baby's room we wanted to get the healthiest paint option to limit my wife's exposure while pregnant. She initially researched the No VOC paint so she could help me paint. Unfortunately we found out that it's not recommended for you to paint while pregnant even with the greenest of paints because there are still chemical fumes released while it is wet. The first paint we tried was the Freshaire Choice paint you can buy at Home Depot. 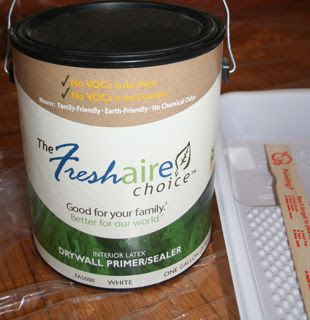 Freshaire requires you to prime the room before you paint for all applications. I learned the hard way a few years ago about not priming when it's required. (Removing peeling paint is not fun.) So after we paid the nice automated check out robot $75 for a gallon of primer and a gallon of paint we were on our way. The primer went on easily but unevenly which I believe is normal for a primer. I thought the chemical smell was quite strong with the primer and my lungs felt kind of raw after finishing. So when it came time to use the paint I put on a chemical vapor mask just to be safe. The no VOC paint had an almost non existent odor and went on smoothly, but even with a primer it still required two coats. The dry paint looked really even after it was all dry and was probably my finest masterpiece yet. There is no accounting for taste. As I found out afterward the no & low VOC paints are only available in limited colors, which was hastily chosen and needed to be repainted because babies don't like neon pink I guess. 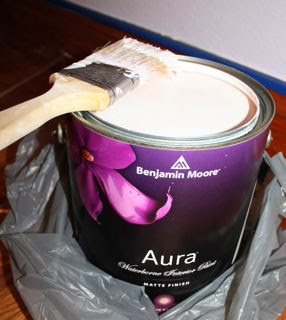 So we went searching for another paint that could be applied in one coat and I ended up choosing Benjamin Moore's Aura paint which is low VOC. The Aura paint also comes in a limited amount of colors, but since we wanted to do a really light color we figured that we could add tints from another color collection and the VOC's added would be minimal. This paint seamed to have a very light smell that was much less offensive than the Freshaire primer. Unfortunately the paint still took two coats but it is also self priming so it's one more step you can skip. This is good because the paint is expensive at around $50 a gallon, but compared to the $75 spent on Freshaire's paint & primer it was a bargain. The paint is very thick and I kept thinking I was buttering the walls more than painting. I just barely finished the room with one gallon compared to the Freshaire which I had half a gallon left. The Aura paint looked streaky when drying, but when it dried completely it was very even in color and filled in a few flaws in the wall. 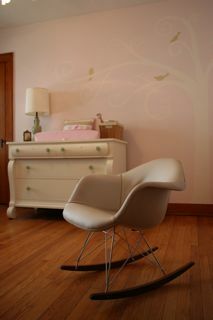 If I had to do another room right now I would choose the Benjamin Moore Aura paint over the Freshaire paint. Mostly for the fact that the Aura paint is self priming which cuts down on the painting time and I feel that the Freshaire primer was really toxic smelling. Though there was very little oder with any of the paints after it had dried. Plus you can buy the Aura paint in quart sizes but the Freshaire currently only comes in a gallon size. I also suspect that the Aura paint will hold up better against wear and tear. Which is good because after painting a room twice I won't be ready to paint for awhile. Aura is one of the best covering paint on the market. I painted my kitchen in Garrison Red(a dark red) in a single coat. It is absolutely beautiful. Smooth even sheen with no lapmarks. The key to good coverage is to not spread the paint too thin. Use a 1/2" roller or 3/4" roller for heavy texture. Yolo paint has a bad smell to it compared to the aura, not nearly the same coverage either. Yolo was sub standard. Thank you! Very helpful review. I just finished painting my toddler's room with Fresh Aire semi gloss and I really expected it to not have an odor, and it did. It smelled just like any other paint! Well, maybe not AS BAD, but still. I wanted him to be able to sleep in his room after I painted, but we had to wait quite awhile before he could go to bed. Next time I'll try Ben Moore's. Fresh Aire really does have limited colors too. I wish I had known about Ben Moore before I went to Home Depot. I just used the Freshaire product and was very not pleased. Lots of coverage issues, priming a must. It took three passes for decent coverage. Unfortunately only went to the reviews AFTER not being happy. Thanks for your review. I've always had good luck with Benjamin Moore products and won't stray again. I have not painted with Freshaire yet, but from what i've read, i understand the reason for the limited palatte is that the colors come from powdered tints. Hence 0 VOCs. Perhaps they elected to launch the product with an "introductory" palette and if successful, will expand the color selection. This product is disappointing. Caution to all potential customers. We chose a shade of red that resulted in a shade of nasty flesh pink. While at the Home Depot, I did ask the clerk after she processed the color (using the -instant color pack for the paint-) if the odd shade of pink would darken when applied to our home's walls. She assured me it would-i.e.-be Rhythm Red. My husband spent a day applying the paint to our walls. It was awful. The color did not darken. It is a retching shade of flesh pink now. Do not trust this product! If the color is different than on the swatch you should be able to take it back to the store and at least get a refund for the paint. Tell your husband I feel for him. Best of Luck. Ben Moore low voc Aura is awesome. I used it when it first came out in my homes bedrooms. The quality is great. I have used other brands and this is the one I will stick with. Thicker quality paint will save you from color bleed thru, spotting in bathrooms from water and it is a very color true product (no almost mistakes). Ben Moore rocks! I used Yolo to paint my entire condo and it had no smell at all. It also only required one coat for total coverage, but I added a second coat just for the sake of durability. This is an excellent paint choice. Instant color packs? Do they not tint their paints at Depot? For red colors on they wal, you can save yourself time, by not applying several coats of paint. You're spending money unecessarily, not to mention wasting valuable time. The best way to apply red, is to first apply a tintable primer, depending on the shade of red, lighter or darker, tinted GREY. Grey lays down a nice unndertone for the new color. 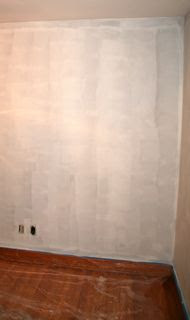 There are tinatble primers, but you would be wise to know what kind of sheen is on the wall, ie flat or Gloss Enamel? If you have anything less than Semi-gloss, you can use the tintable primer. If your existing paint is Semi-gloss or higher, it would be a better bet to use a bonding primer or "multi-purpose" primer and have the associate tint it to an appropriate grey. They is room for at least an ounce of colorant even when the off the shelf primers are full.